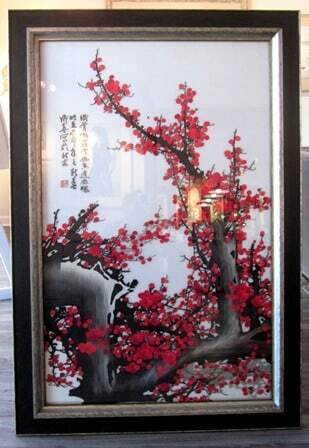 A client of THE FRAME STUDIO brought this beautiful silk embroidery all the way from his home in China, where he lived for a number of years. This 28″ x 43″ silk embroidery took one artist over two years to complete. Just let that sink in for a moment – 2 years. Our client loved the piece, but the frame it was originally in was very old world, which did not work with his new modern Florida environment. We helped him pick out a custom frame that was modern enough to work with the room, but still had a little old world charm to work with the art. The combination works great. We wished we could keep it for ourselves!